Apparently this bug is another Groundbug. It was photographed in June 2004 and was exactly 11 mm long. There are quite some similar bugs, but we were not able to find out what species this could be. Luckily there was Dr. Wolfgang Rabitsch, a well known bug expert from Vienna who was able to help us. 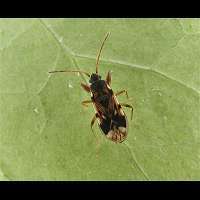 This species is called Scolopostethus pictus. We looked all over the web, but were not able to find any information on this animal, except for the fact that it apparently lives all over Europe. There are several similar species.